Last week we got our Christmas tree from Boy Scout Troop 100, as my parents have done for years before me. Prince Charming and I will have been married for nine years come New Year’s Eve, but we’ve only been putting up a tree since we moved back to Seattle. It’s one of those traditions that I love, but that twenty-somethings-living-in-apartments rarely do. Fortunately we inherited two boxes of ornaments from Ryan’s childhood, so we were all set once we decided to deck our own halls. One thing missing was a tree topper. When I draw Christmas trees, I’ve always drawn a yellow star on top. The ornaments and lights change, but the star has always been the crowning jewel, despite not having one in real life. With a little felt, stuffing, and yarn, my Christmas tree is now perfect. One of the coolest things about holidays year is that J is old enough to participate. We’ve had great fun introducing her to Saint Lucia, Frosty the Snowman, creches, Christmas lights, and eggnog. She really enjoyed picking out and decorating the tree with us, and begged for her own tree in her room. J: Daddy, I want a pink tree! Daddy: Anything you want, Princess. Me: And next he’ll buy you a pony! 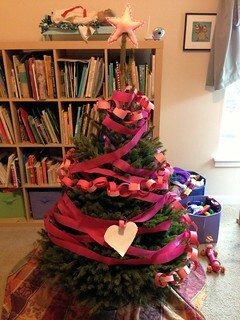 Ryan’s brother was in town for the week, and he helped J decorate her tree pink, as requested. I made a tree topper for her too, pink, of course. I like to make things up as a go along. Here it is, my first tutorial. Please comment if you have questions. 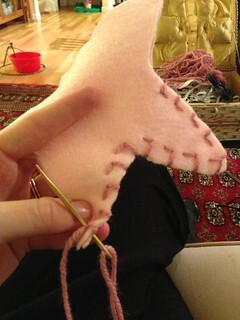 Take two equal sized pieces of felt and fold in half. Trace half a star along the fold, so that when it is unfolded you will have two identical symmetrical stars. You can be a perfectionist about this and make each star point the same size, but I think a little asymmetry looks better for this kind of ornament. 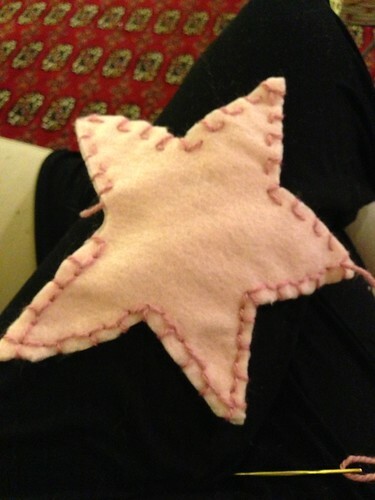 Cut out your 2 felt stars. 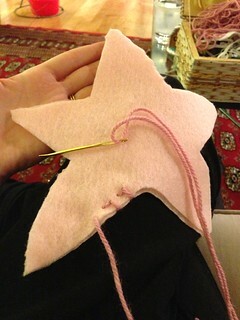 Sew stars together, making each stitch about 1/4 inch. I looped around the outside edge every other stitch: over, under, out and back through same hole; over, under, out; repeat. Make sure you leave enough space at the bottom for a hole to a) stuff and b) fit on the top tree branch. When you’ve gone all the way around the star once, turn around and fill in the remaining stitches (over, under, over, under) back through your same stitch holes. 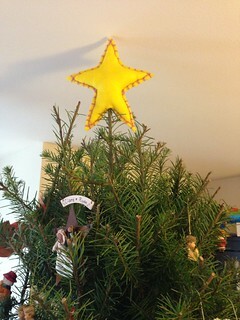 Don’t forget to leave enough room for the tree to fit in the center hole at the bottom of the star! See below: first round of stitches completed on the top half of the star, second round filling in on the bottom half of star. 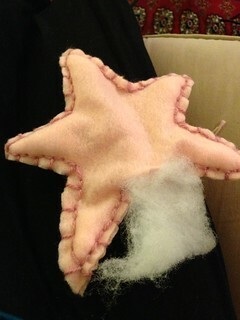 Secure end of yarn with a knot inside the star and cut. Stuff cotton batting into star, leaving some room for the tree top. Hellllloooooooo! Despite my promises of crafty goodness on this revamped blog, I didn’t get my contracted book done until yesterday. But now it’s IN. DONE. OFF to New York, and I am FREEEEEEEEEEEEEE. At least for a little while. Tootles’ due date is fast approaching, and there are still preschool applications that won’t write themselves (not to mention revisions, copy edits, and page proofs for book 3!). But I promise to get in a few updated craft projects before I go dark with the new baby, and I’ll start with one of my favorite craft holidays: Halloween. In October we took J to see the Cat in the Hat at the Seattle Children’s Theater, which she loved. It’s a strange story, certainly not one of my favorite of Seuss’s, but I think the magic of theater won J over and she was hooked. She asked repeatedly for the story of how we went to the theater and saw the Cat in the Hat, and when it came time to talk about Halloween, she was certain who she wanted to be: Sally. Now Sally is a) literary and b) unique, so you know I was thrilled to make her a Sally costume. (Search for Sally costumes, and you’ll only come up with the rag doll from the Night Before Christmas. Search for Cat in the Hat costumes, and you’ll only find the Cat or Thing 1 and Thing 2.) I didn’t have much time, because I was desperately trying to finish aforementioned book, but I gave it my best shot. All you really need for a costume are poster board, felt, and hot glue. Ryan was going to be the Cat in the Hat; J, Sally; and I, the fish, with the bowl around my ever increasing belly. 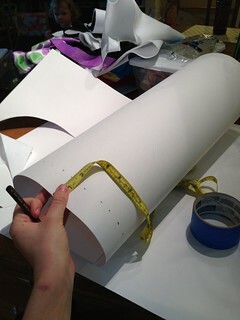 Step 1: Measure Daddy’s head using one of his real hats and roll poster board to the correct circumference. Glue along seam. Step 2: Measure and mark one inch or so all around the edge where the stovepipe will meet the brim, and cut many tabs up to this line. Fold little tabs over. These will glue to the brim. 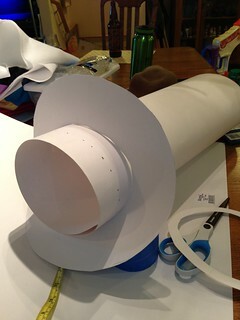 Step 2: Cut a large oval the correct size for the brim. I used a cowboy hat of Ryan’s as a model. Trace circumference of stovepipe in center of brim oval, and cut out middle. Put brim around stovepipe. 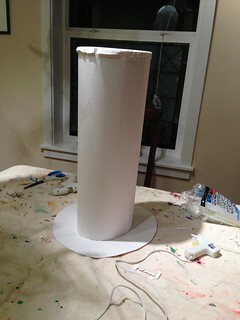 Once you cut the tabs all around the base of the stovepipe, fold up and glue to bottom of brim. 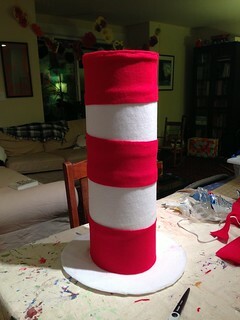 Step 4: Cut out felt in red and white strips. Glue them on in alternating stripes. 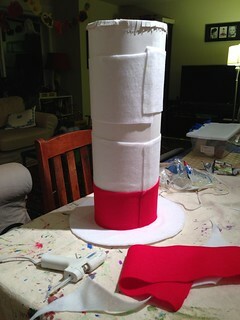 Cut out brim and top out of white felt, and glue to poster board. Step 5: Once the glue dries, you are done. Try it on your model. Revel in your awesomeness. Mr. Stewart’s costume also involved a red bow around his neck. I planned for him to be able to wear jeans and a tee shirt, so that he would feel comfortable in costume. 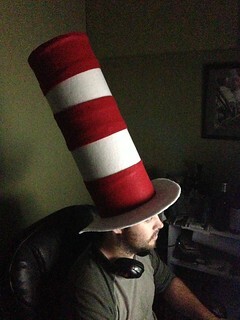 One needs no extra frills to be the Cat in the Hat: the hat says it all. However, if you had a model who wanted to get really into character, you could have him carry a rake, pink cake (more poster board and felt! ), and some books.